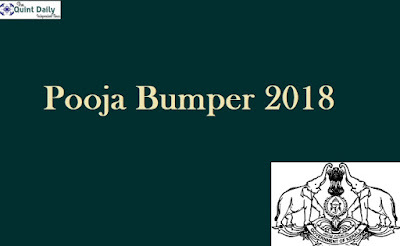 Pooja bumper 2018 Results 30.11.2018: The very lucky person for this season has been unveiled. The official declaration of Pooja bumper 2018 result is now Live at Sree Chitra center along with the Nirmal NR97 results. After the successful declaration of Onam bumper results online, lottery department of Kerala unveiled the lucky update of Pooja bumper BR64 tickets. The ticket price money comes around 150 and if take a book it will be 120 per ticket. The sale lasts for a period of 2 months and figured BR64 to sell out more than 10 lakhs of tickets in a span of this time. Pooja bumper BR64 updates and notification as stated in the ticket unveiled along with the sale. However, the ticket forwarded the stipulation in such a manner that each ticket of BR64 prizes in digits of 4 and 6 got different features. Each feature of the ticket has been executed at the backside of the Pooja bumper 2018. Well, the Christmas new year bumper tickets are ready for their entry after the declaration of this Pooja bumper 2018. Let us take a look on to the idea on how to check the results for the Pooja bumper Bagyakuri BR64 here Online. Go to the ticket and make sure the Pooja bumper series dated 30.11.2018 matches evenly with the series of draw BR64. Follow up the pattern and check whether your tickets number of 4 and 6 included or not. Make sure that the Subseries of BR-64 tickets managed for the Pooja bumper lottery scheduled 30.11.18 matches. The prize money can be collected for the BR64 tickets as per the follow up in the upcoming days as per procedure what lottery department says.